We just wrapped up harvest season at the swamp and have now introduced more baby alligators to our family here at Alligator Alley! 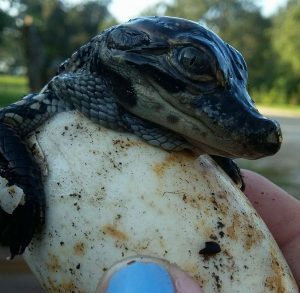 But before these eggs hatched, we had to retrieve them from their nests – you know, the nests made and guarded by angry mama alligators. Not the safest task, but a life-changing experience for sure. 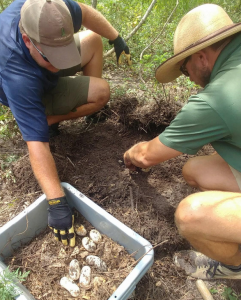 Every year during harvesting season, typically alligator eggs begin to hatch and use their egg tooth to crack open their shell and escape into the world. Once they have emerged from their shells, they immediately begin their search for food and dodge predators along the way. 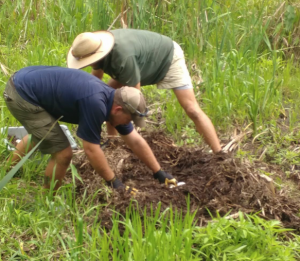 On alligator farms, the staff often assist the mother in the process, which is called “harvesting.” Basically, the farmers will retrieve the eggs from the nest and place them in an incubator. After they hatch, the hatchlings become new additions to the farm! These baby alligators are watched over by their protective mama alligator until she believes they are ready to “take on the real world” by themselves. This generally takes about a year and then the baby alligators join a pod for up to three years postpartum. 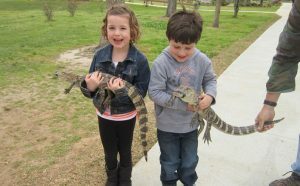 Staying in pods help protect the young from predators like raccoons, large fish, birds of prey and even other alligators! As eggs usually hatch in June or July, they begin to leave the juvenile stage and transition into adulthood while still protected in their pods. 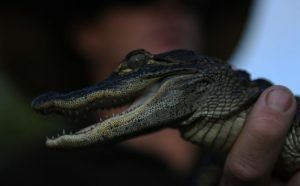 Once the young alligators have reached four feet in length, they are then considered virtually invulnerable in the wild (and at the swamp), except to other, bigger alligators. Now that you know all about harvesting and what follows,come visit ournew babies at Alligator Alley! While you’re there, be sure to hold them and maybe if you’re lucky we’ll let you name one!